We want to take the time to Thank You for such an amazing ceremony you put together for us. 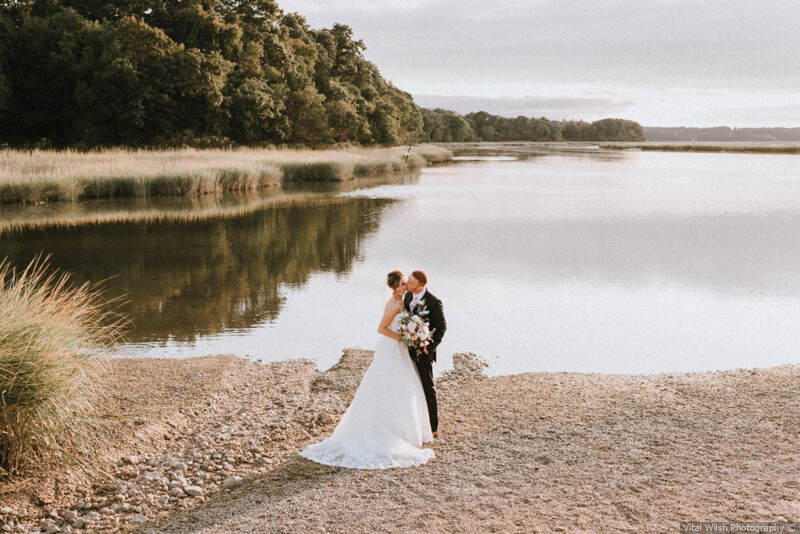 Started with a very long distance emailing back and forth and a phone call as we live in Sweden but had our wedding here in New York. She was very through asking as many questions and getting to know us by our story. 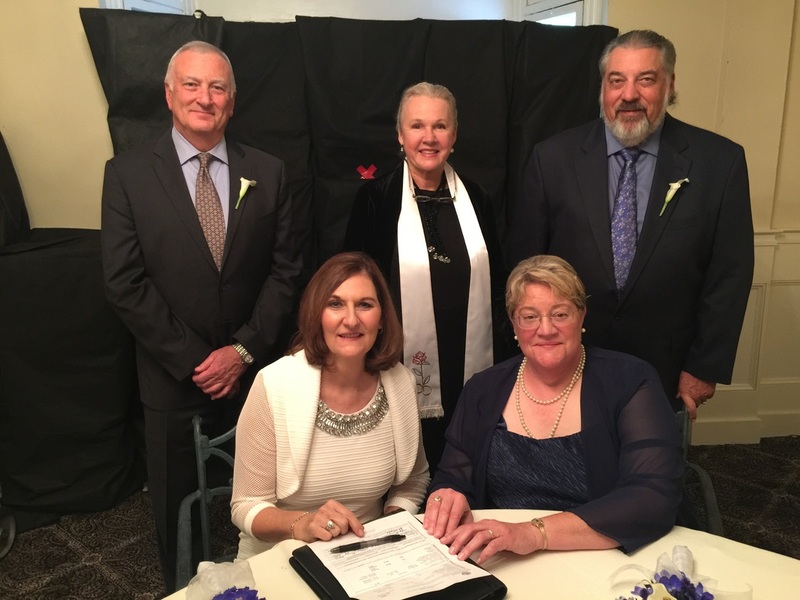 The ceremony was lively, fun, it was everything and more than we hoped for. 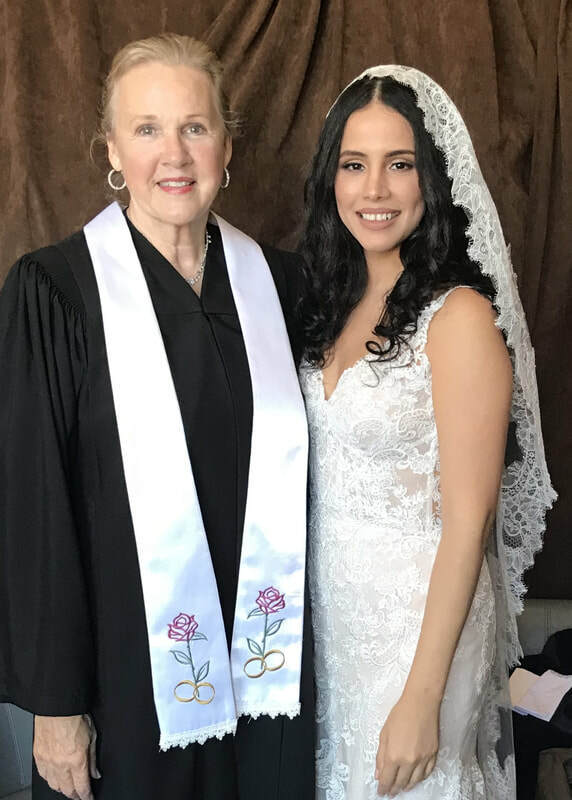 My mother and bridesmaids mentioned to me what a profesional and straight forward she was not just with them letting them know and explaining to them that would happen but also the whole way into the ceremony. 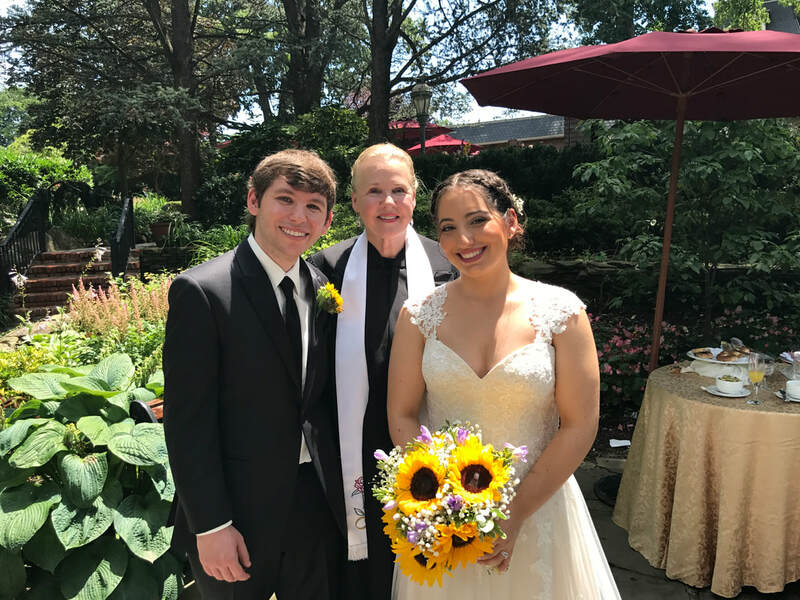 Wonderful Officiant - you can see she loves what she does! THANK YOU FOR MARRYING US! 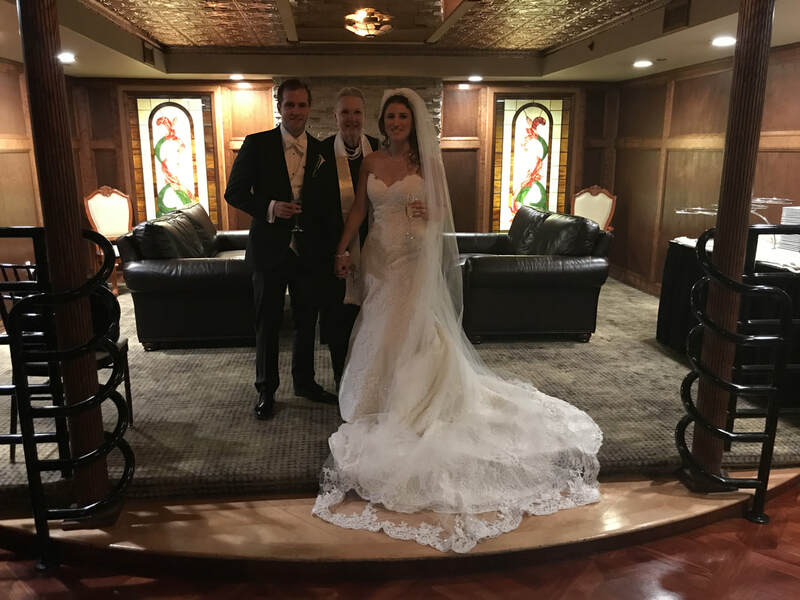 Your support prior to the wedding, and our romantic ceremony made our wedding day unforgettable. 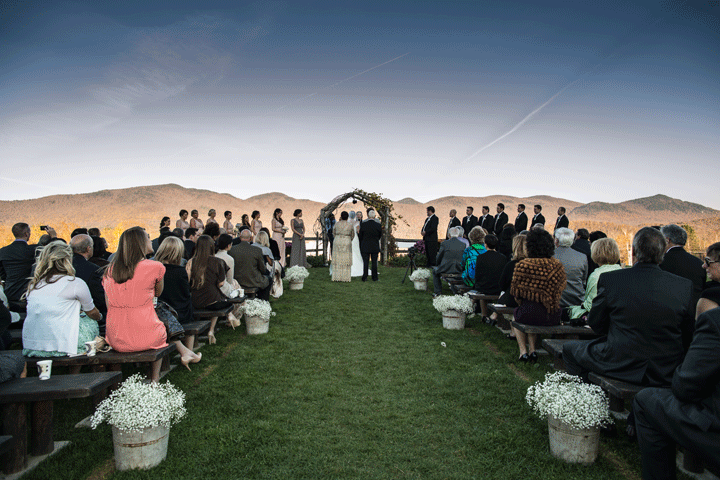 The vows, the love, the laughter and the warm October sun — we had it all! 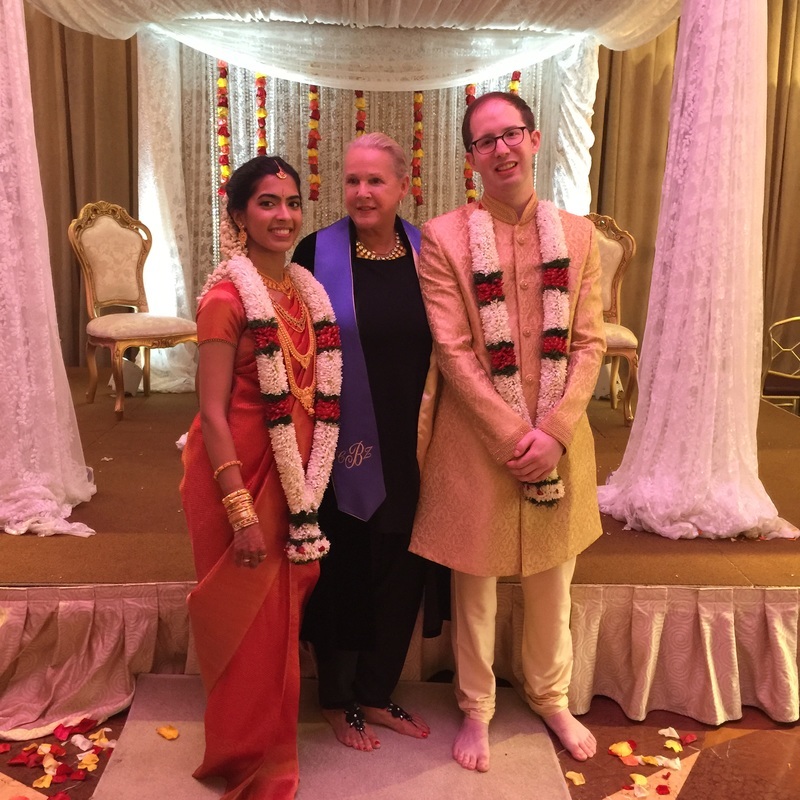 With neither myself or my now-husband particularly religious (he is Hindu and we had a separate wedding all together for that, I'm Catholic), we knew we wanted a relatively short ceremony with some readings and blessings and something that was just 'us'. Enter Caroline- you've read the amazing reviews and hopefully checked out her website, but if you're still on the fence, schedule a meeting. We went to her home for an initial meeting, which is insanely lovely, and she put us at ease from the beginning. She was always quick to respond to emails and easy to work with through the decision making process of what we wanted our ceremony to be. We went with the package that included our 'love story', handcrafted by Caroline herself and we could not have been more pleased with how the ceremony came out. 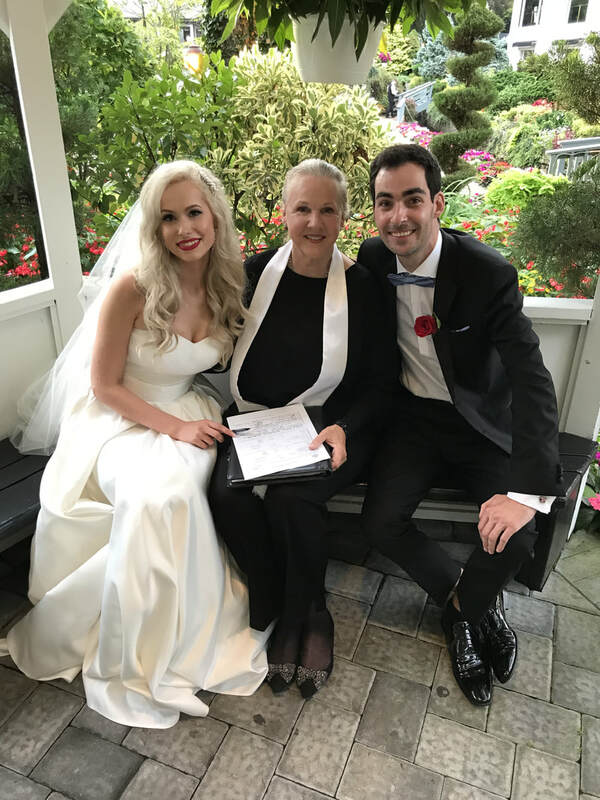 I am writing this on my way home from our Hawaiian honeymoon and I know I'll sit back down to relive the ceremony next weekend when I don't have any wedding to-dos to check off a list, by reading the transcript that Caroline provided us of the ceremony. 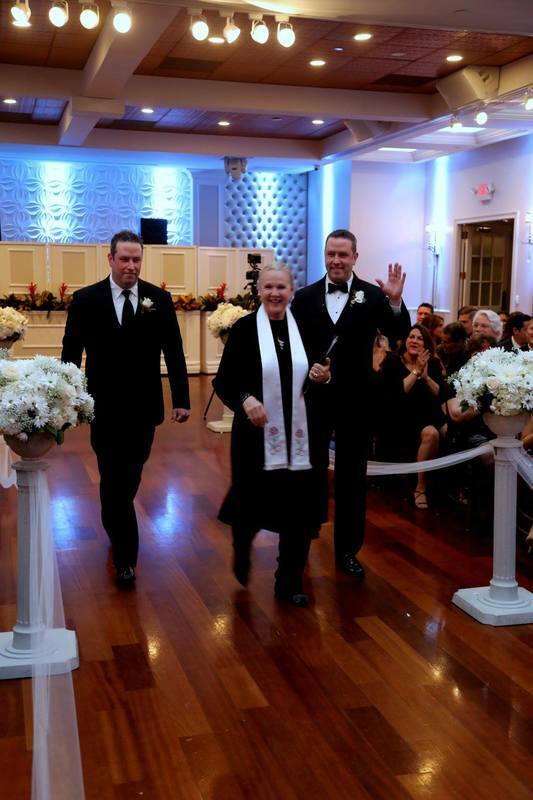 As an added bonus, I cried the entire ceremony from procesional to recessional! 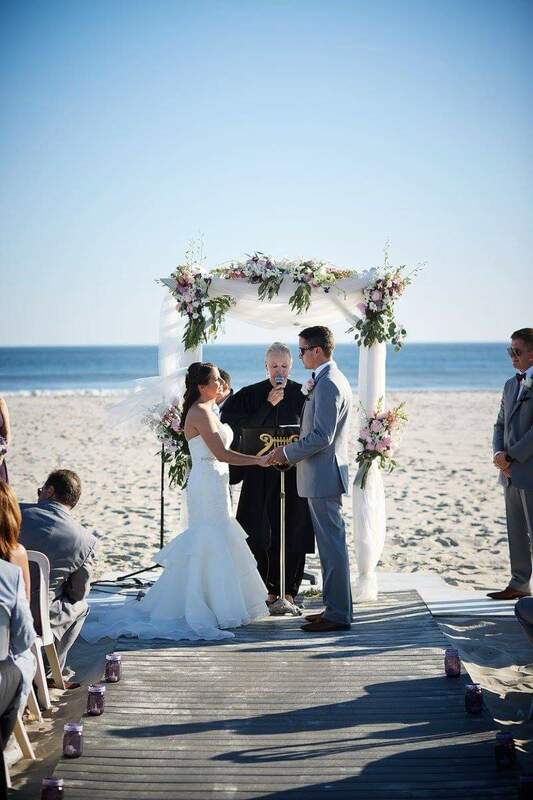 Our Long Island Gold Coast mansion wedding took place on an outdoor patio at sunset and it was just perfection. Our kiss photo has Caroline standing next to my MOH, mouth agape, smiling at our love, and I know her reaction was genuine. A piece of the process that I loved was our final meeting with Caroline, where we were interviewed separately by Caroline to get some quotes for our love story. 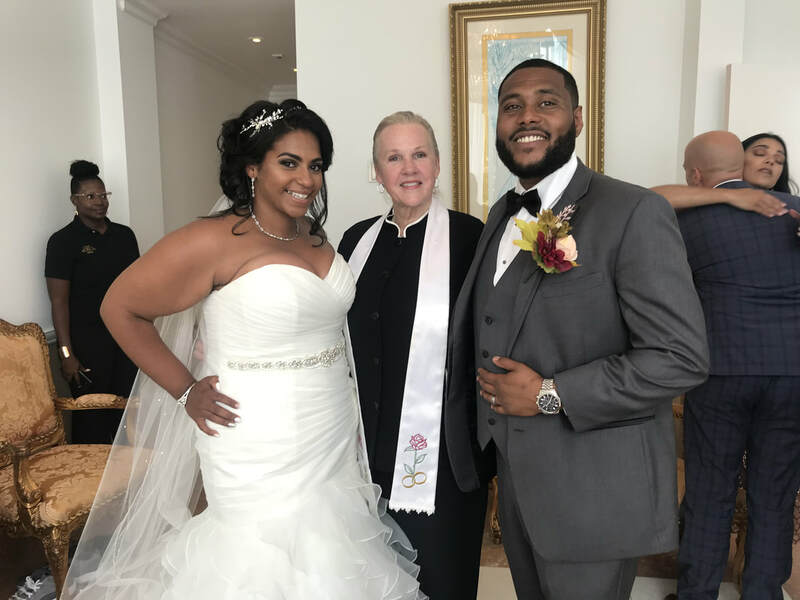 This was a beautiful moment for me when I reflected on the reasons I love my husband, why we were getting married in the first place, amidst all the wedding stress that goes along with planning. It was an emotional morning for me and I wouldn't have had it any other way. I am not sure of where to start to describe my experience with Caroline but a good place to start is this: Caroline is the BEST!! Caroline was a vendor on our venue's preferred vendor list and I am so happy that we picked her. We got married a week ago today (08/25/18) and I can honestly say from the moment I contacted Caroline right up to the day after the wedding she has consistently checked in and followed up with me. 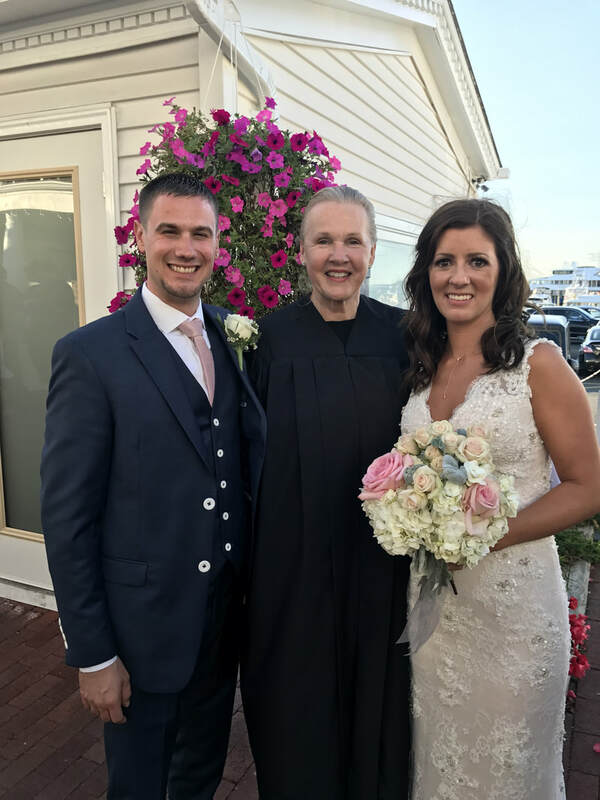 Throughout the entire process Caroline was and remained kind, patient, a consummate professional, charismatic, funny, personable and stylish ( I loved her wedding day shoes). 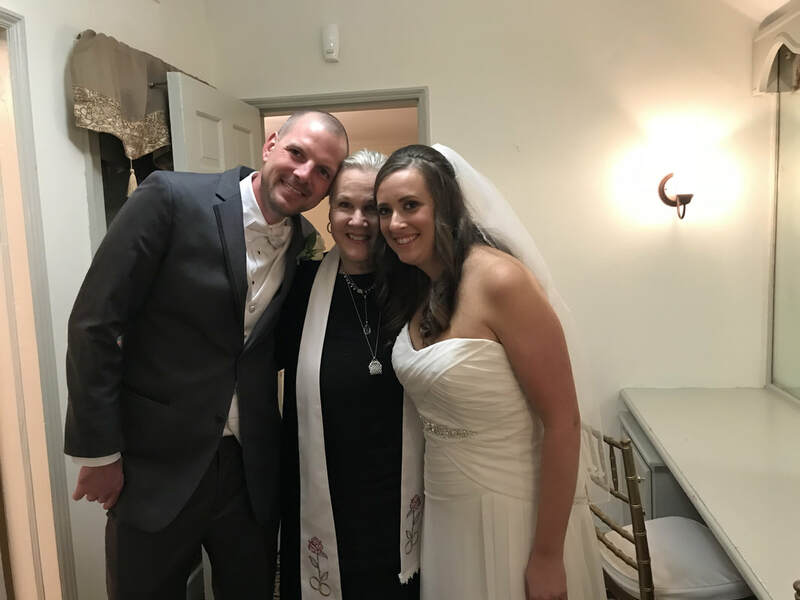 In terms of our ceremony, my husband and I had specific requests regarding readings, wording, and symbolic rituals that were indicative of our beliefs and culture and Caroline was more than supportive and welcoming of our needs. She even helped me pick out glasses for our tasting ceremony. Caroline is hands on and detail oriented which was a must have with so many moving parts to our wedding. There was alot of late night and early morning emails and phone calls to confirm/calrify all the details of our ceremony. Caroline was patient through it all and even at the very end when things became chaotic, she was there to remind me that everything was ok. 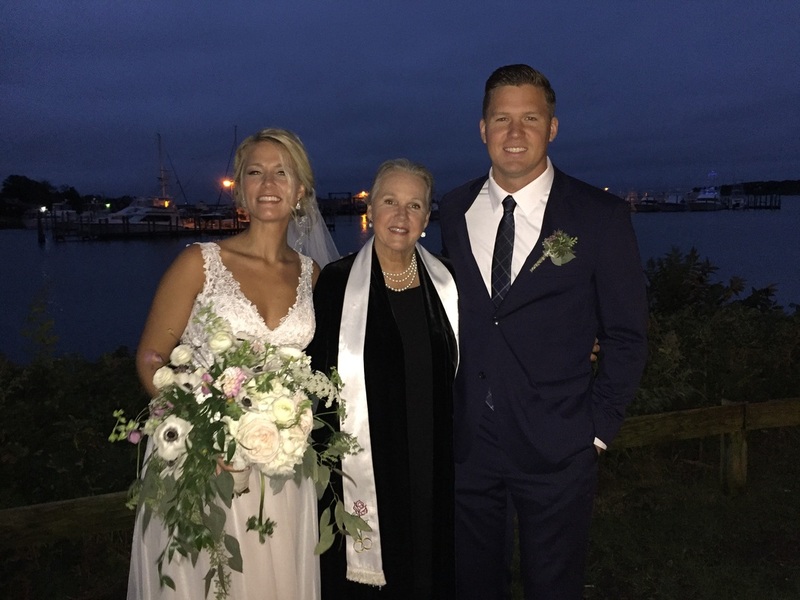 Even though we did not meet until the day of our wedding it was as if my husband Chris and I had known Caroline for a long time. 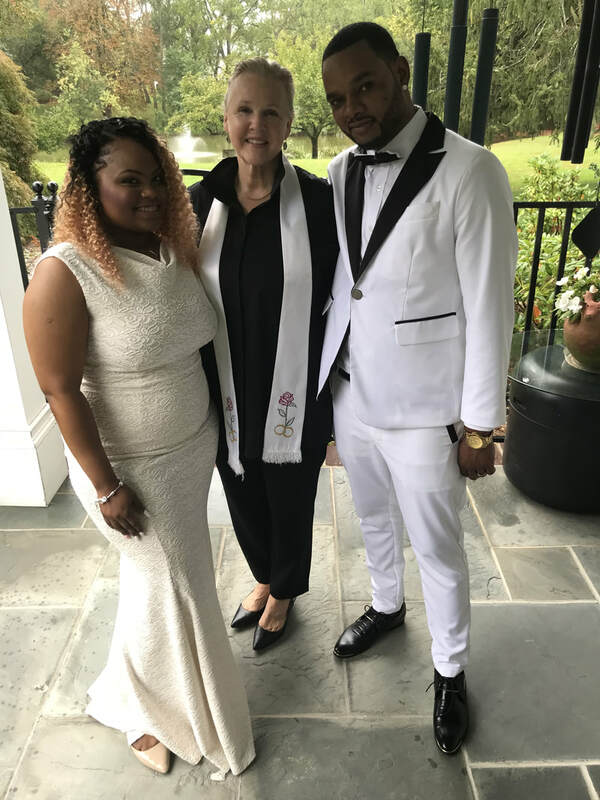 We had talked so often over the past few months that our ceremony was personal, our interactions and conversations naturally flowed between the three of us. We had a few light hearted moments during our ceremony that really spoke to the relationship we had developed in the past 8 months. We are incredibly happy with the job well done by Caroline, and I could not and asked for anything more or anyone else!! Oh my...what can we say? If there was anything that we didn't have to stress on our wedding day, it was Caroline! 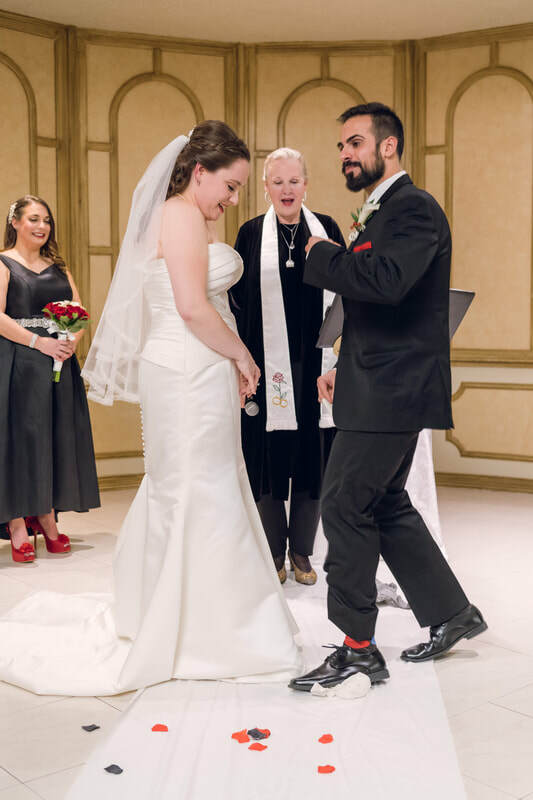 Between her extremely prompt phone and email responses, her articulate wedding "run of show" that she color coded and emailed in advance, Caroline was an absolute honor to have in our wedding. 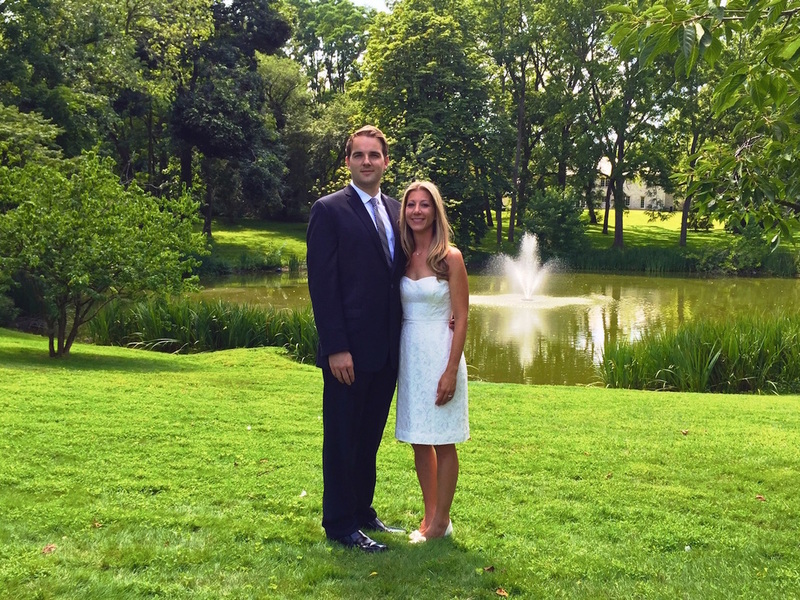 Caroline made us and our families feel extremely comfortable and well rehearsed for our big day. Thank you, Caroline! Caroline was a recommended vendor from my reception venue. From our first conversation, I knew right away I had found the person who would marry us. She had such a soothing voice, had tons of useful information, and her experience reassured me. About a month before the wedding, we started to put together the ceremony details and her organization once again reassured me. 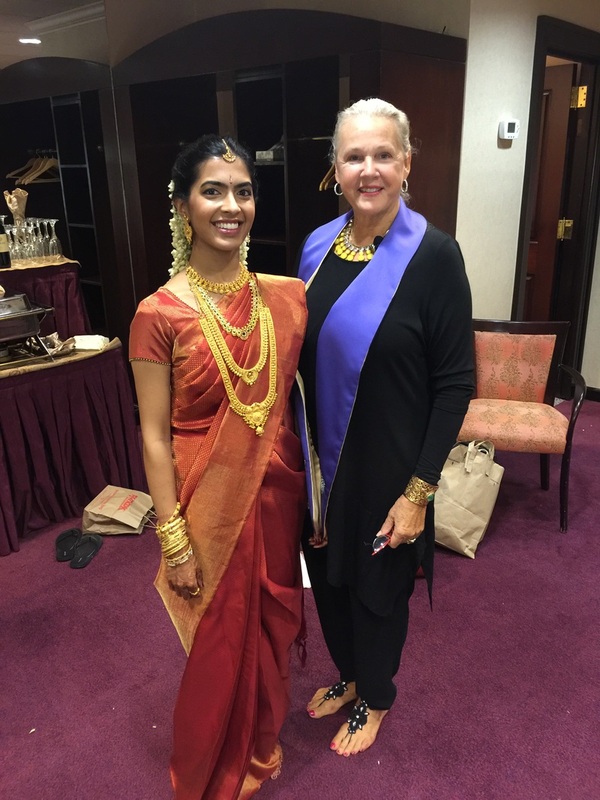 Her setup sheet allowed me to conduct a rehearsal myself, and my bridal party was really thankful for that. Our ceremony turned out to be a beautifully personal and touching retelling of our love story. 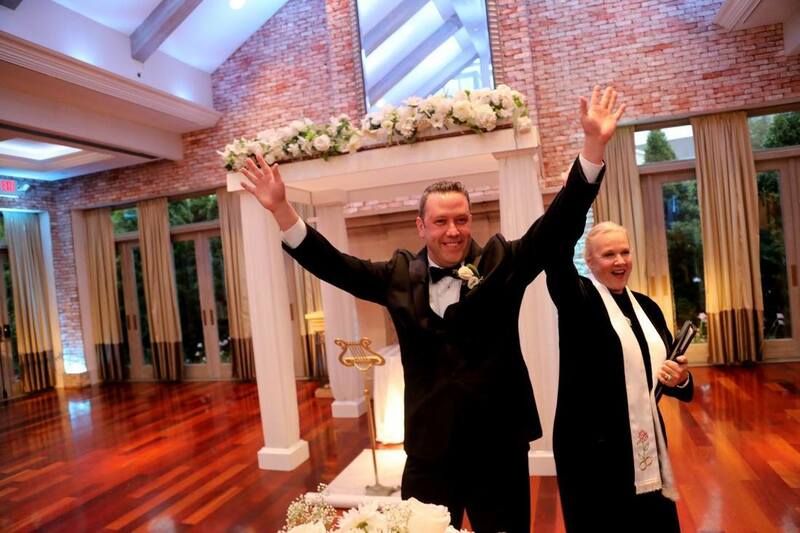 Our family and guests still tell me that was the best ceremony they have ever attended. Caroline, thank you a million times over. You created a special moment we will never forget. 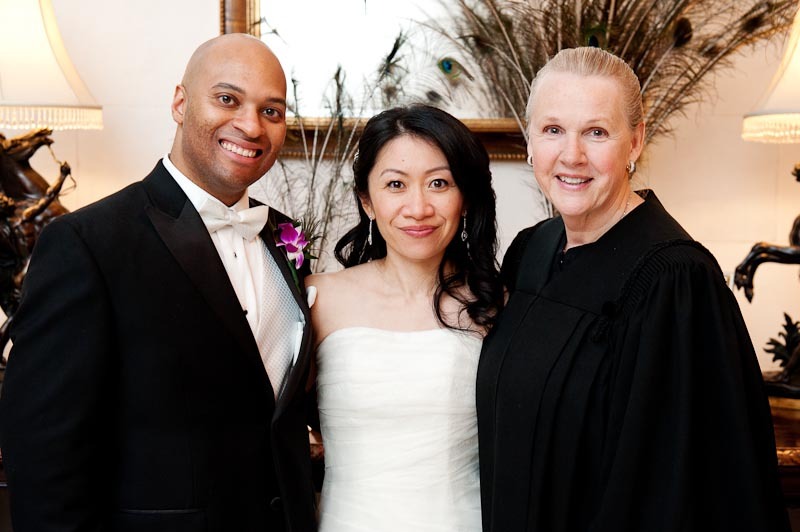 Caroline officiated my wedding last month, and she is simply the best! 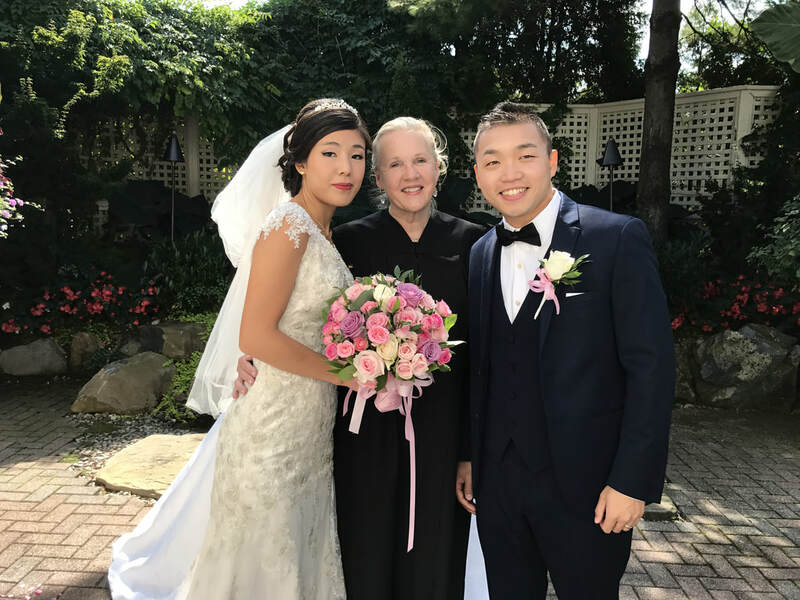 I knew from the very first conversation I had with Caroline that she is professional, detail-oriented, and thorough in her work, and that she has unparalleled experience in creating memorable wedding ceremonies. 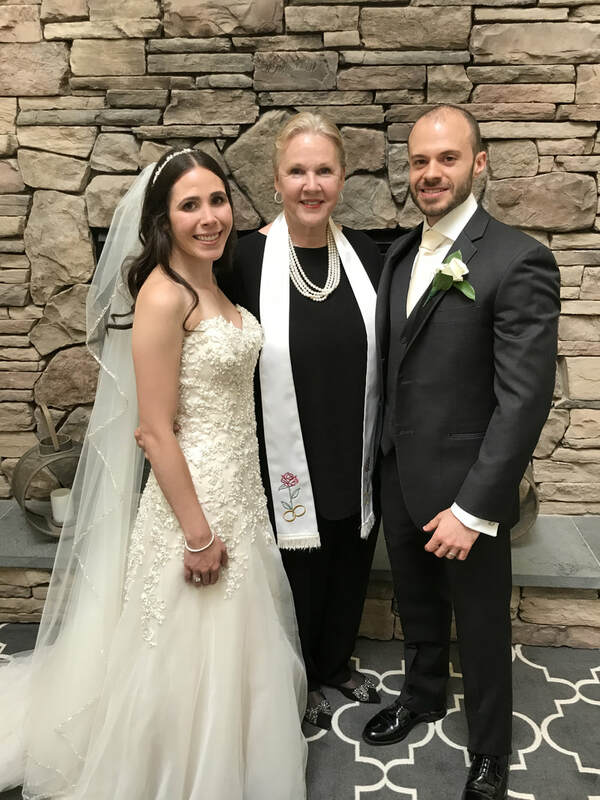 Caroline was so helpful in presenting several options for the ceremony, finding the one that best suited my husband’s and my style, and in giving us great ideas to make the ceremony very personalized and special. 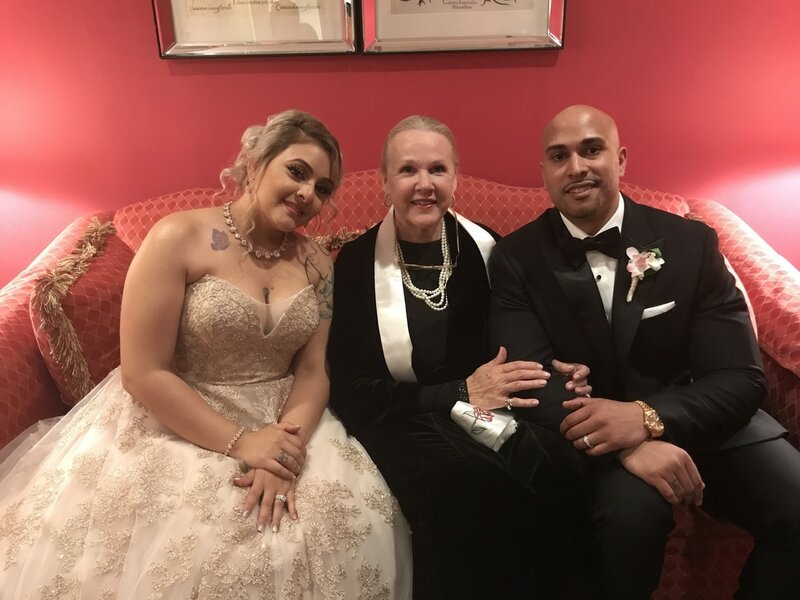 We were able to cover all preparation for the big day via phone and e-mail, and she was fantastic in taking notes and sending a re-cap after each interaction. On our wedding day, Caroline arrived early and all went very smoothly. 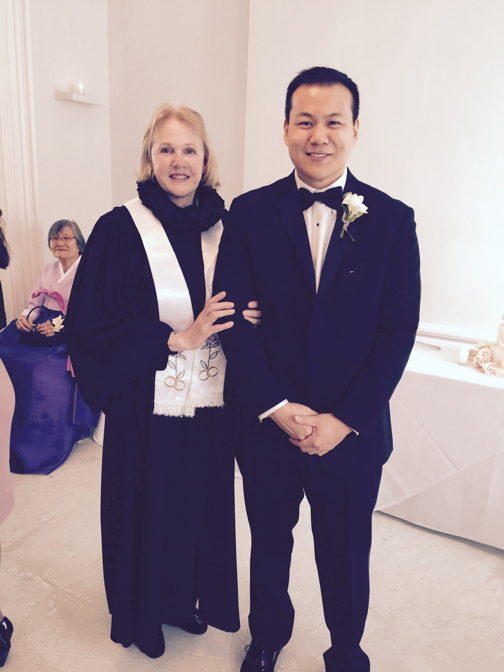 If you’re in search of an officiant, I doubt you’ll find one better than Caroline! Caroline is the best. 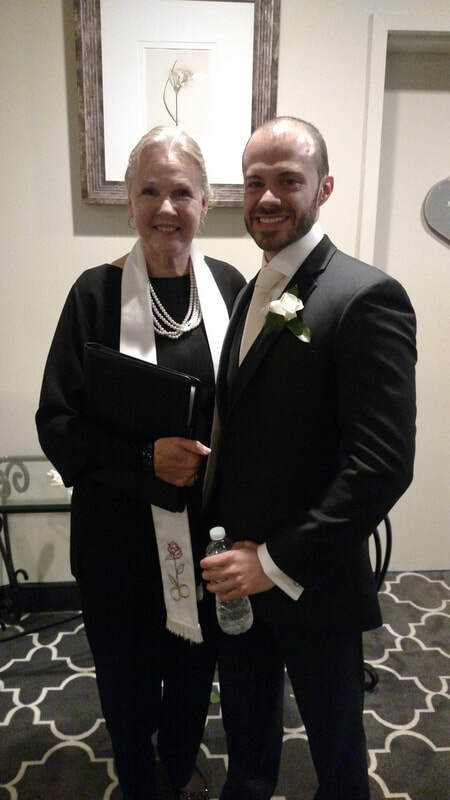 She is one of the most throughtful and thorough officiants I have ever met. She was very detailed when asking me and my husband what kind of ceremony we wanted. She took a lot of care to make sure that we got exactly what we wanted for our special day. It was honestly a pleasure to work with her! The first time we spoke with Caroline we knew she was the perfect one! 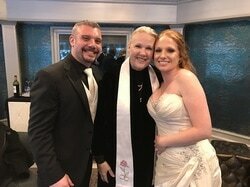 We had our wedding yesterday and had the honor of having her as our officiant! She is absolutely amazing! Completely personable and we felt like we have known her for years! My hubbs is a jokester and she handled it so well, she definitely helped us ease any nerves we had. Like I said, it was like having a conversation with an old friend. Our guests absolutely loved the ceremony, it was perfect and fun! She was extremely attentive to what our wishes were and helped us so much along the way. She made herself available whenever we needed her which was such a huge relief, especially when we had random questions. Caroline, I cannot thank you enough for the day you helped give us (btw we also left you a knot review last night). You were...amazing to say the least and that doesn't do you justice. The ceremony was perfect...exactly what we hoped for and everyone love it. I am not joking or exaggerating in any way when I tell you more than half of the guests at the wedding made it a point to say how incredible and spot on you were (even my secretary this morning said this as one of her first comments to me). My parents were beyond thrilled and are beyond thankful to you for engaging them so much; I know Candice's mom Bunny feels the same way. There will never be a time that I do not recommend you to people...and given my personality...will probably flat out force them to hang up the phone if they're attempting to call someone else hahaha. Wow- just wow! 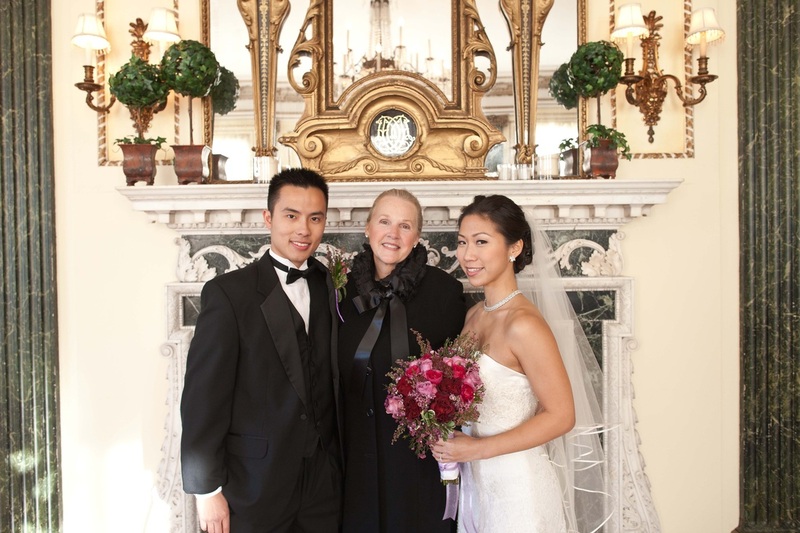 Caroline made our wedding in our home feel so incredibly personable and special. She responded quickly, asked all the questions and gave wonderful insight on ideas for the ceremony. She came on a holiday and couldn't have been more friendly. I truly felt like we had known her far longer than a week! Absolutely top notch! 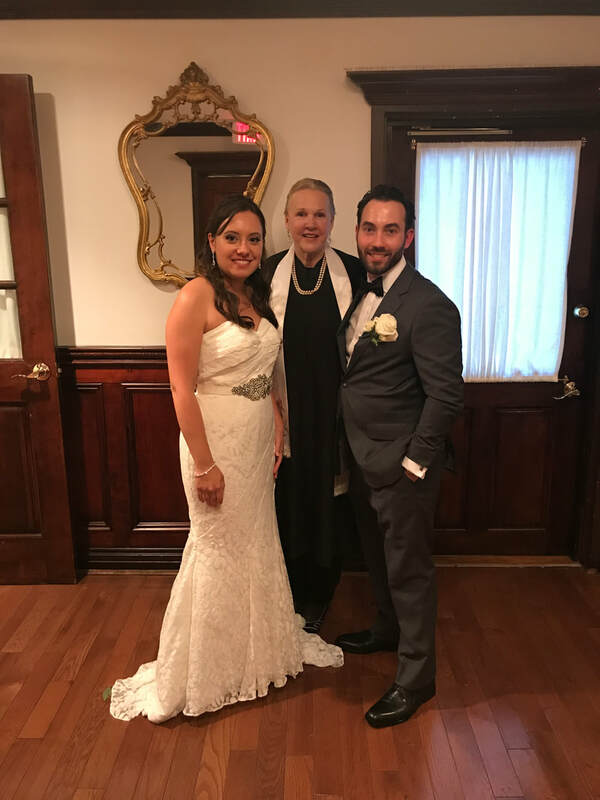 We contacted Caroline about 2 1/2 weeks before our wedding after changing our minds about a New York City wedding rather last minute. She was wonderful to work with, helped us think through the many details that even a small wedding requires and managed to incorporate the subtle and not-so-subtle nuances of family and friends who were in attendance and what we hoped she would emphasize --i.e, what was meaningful to us and to all present. Throughout the process, she asked the right questions, was very accommodating and was personal and warm and helped us to focus on what we needed to do in that very short time span. It turned out to be a great and memorable day for everyone . 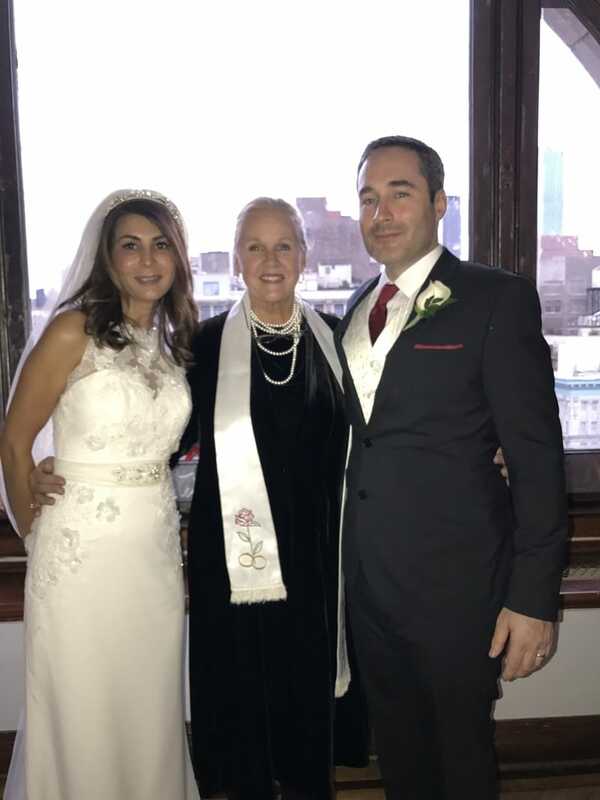 Would also add that what we wanted was a non-traditional ceremony and she never blinked-even as we came down the aisle to the tune of 'Dogs were Barking.' Look it up:-)! Thank you again Caroline-- great memories. ​I do not know where to begin! 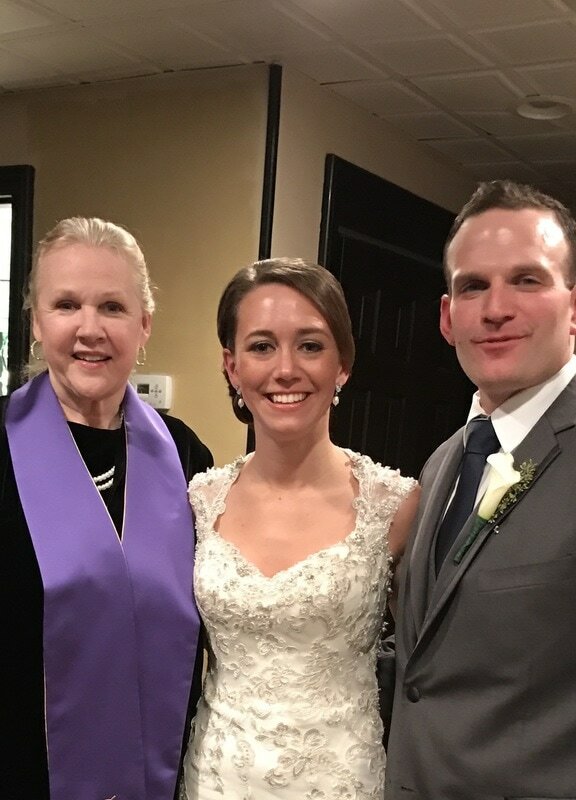 From the moment my fiancé and parents met Caroline at a bridal show to the day we got married Caroline has been nothing but exceptional! Caroline has gone above and beyond, inviting my fiancé and I to her home to discuss ceremony details, and scheduling phone meetings to ensure we were comfortable with the structure and content of the ceremony. 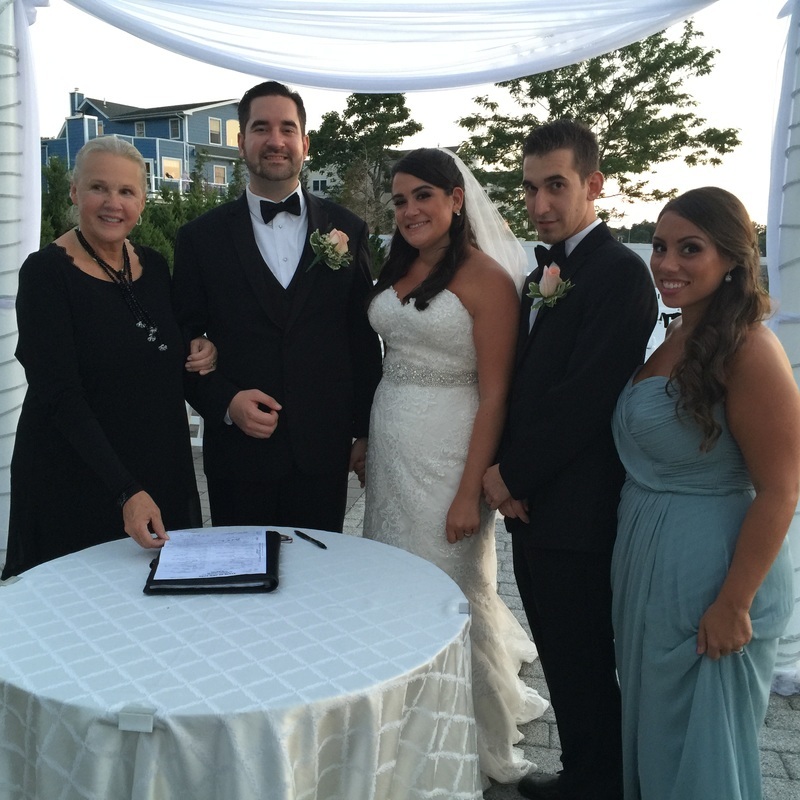 She truly puts the couples thoughts and feelings first as she creates the most personable and thoughtful ceremony. 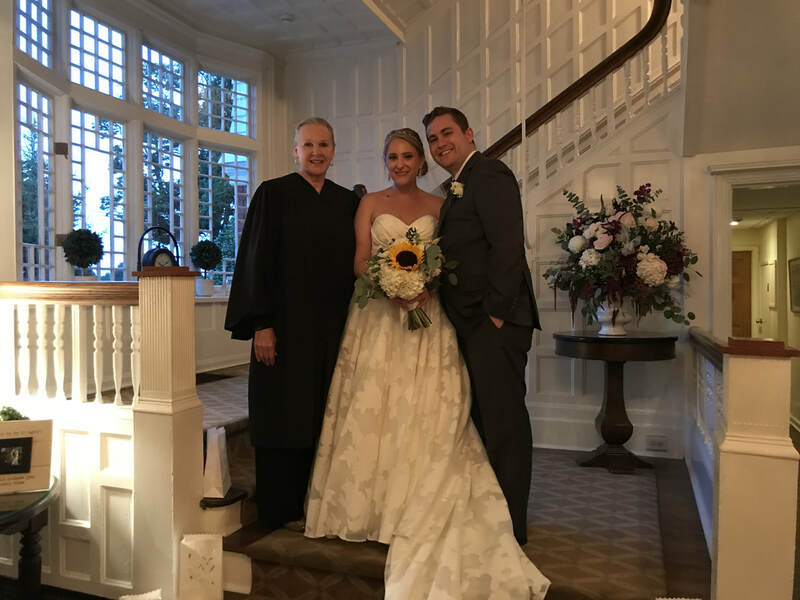 My wedding at the De Seversky mansion was a memorable one, but a very big THANK YOU goes out to Caroline for starting the day off right! 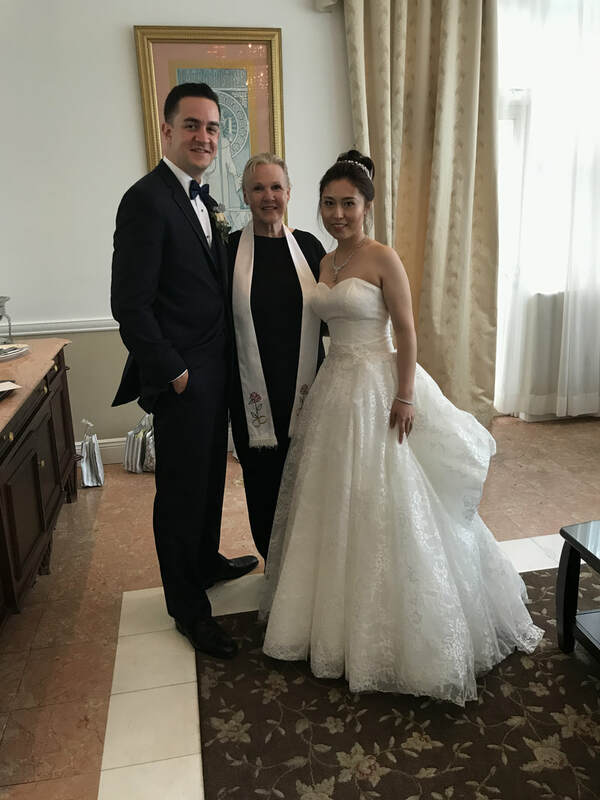 My husband and I belong to the same church but unfortunately could not be married by a priest outside of the catholic church. We wanted the opportunity to enjoy the scenic view the mansion had to offer. 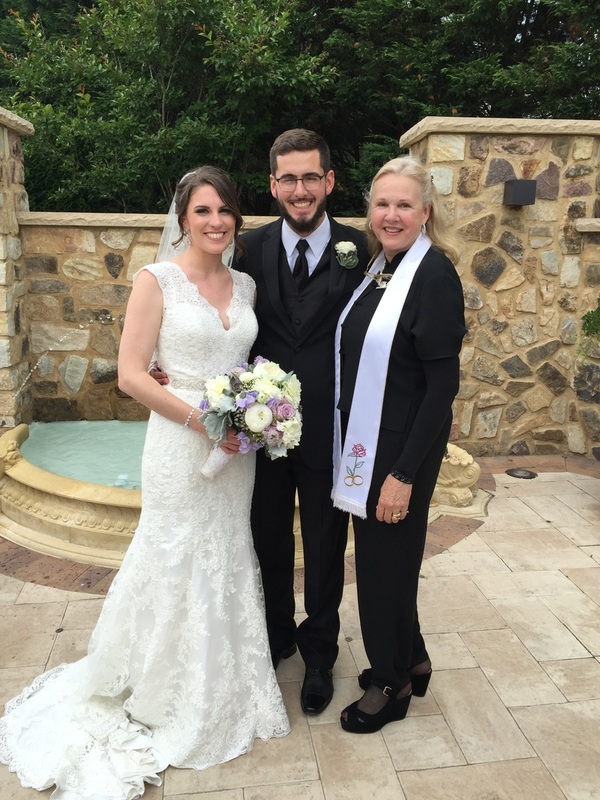 We were hesitant in seeking out an officiant to marry us, but after meeting Caroline, it was an easy choice. We are so happy with our choice and wouldn't change anything if we were given the option! We HIGHLY recommend Caroline!! Perfect!! We could not thank Caroline enough for making our day absolutely amazing and unforgettable! We knew that we had found the perfect person to wed us right from our first conversation. 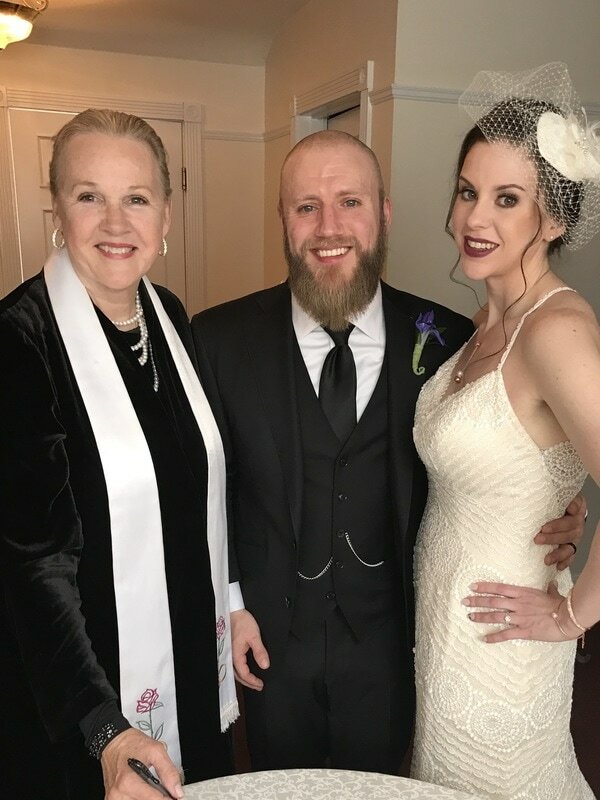 She made the ceremony personal and tailored everything to our needs, calmed us both down before it all started and was the best guide through the entire process! We all shared laughs, tears of joy and it couldn't have been a better start to our future. After the ceremony, everyone we spoke to could not stop telling us how wonderful it all was and how it was the best ceremony they've seen! Thank you Caroline for everything, we'll never forget it!! you performed at your house. Simply perfect. Good Bless you. Caroline was awesome. She explained the whole process down to the letter. 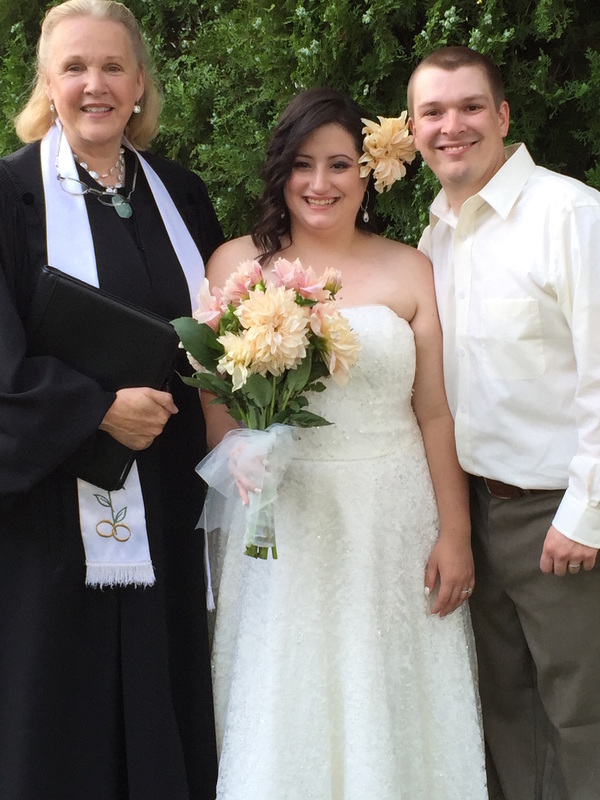 She was very heart warming and provided exactly what we were looking for our ceremony. She provided a lot of support, especially before everything started. Would definitely recommend Caroline for your wedding. You will not be disappointed! 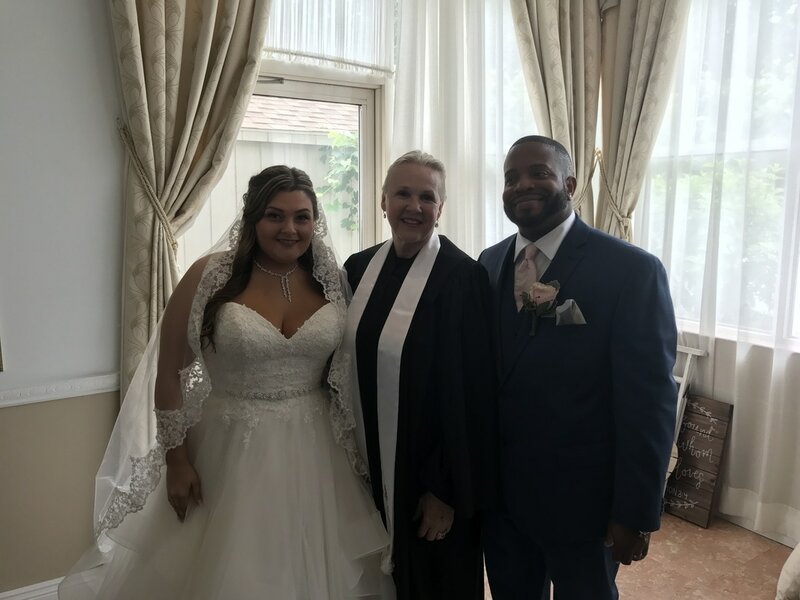 Caroline, thank you so much for helping us with our special day! We could not have asked for a better officiant you were able to tell our story after only two brief phone calls, and it was perfect. Thank you again. My guests all loved her! 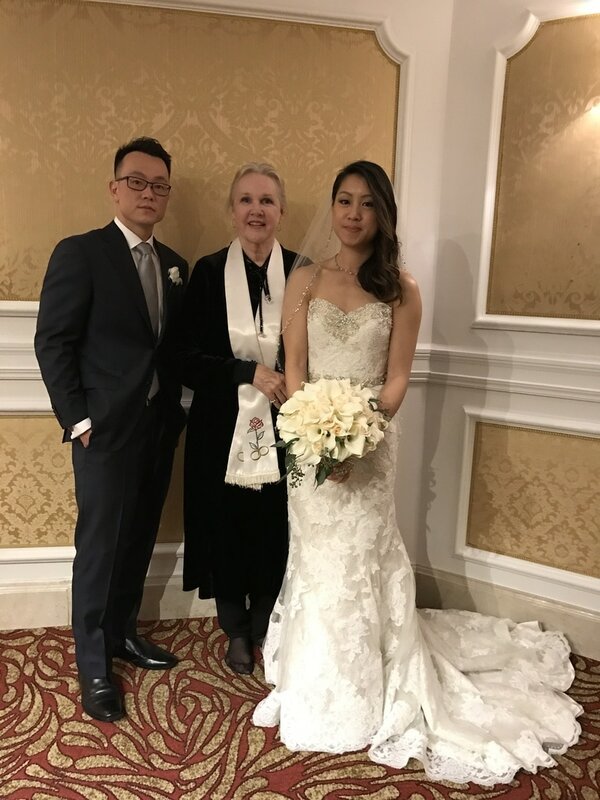 I know very little about wedding ceremony, but Caroline patiently explained everything to me, gave me advice and walked me through the process. 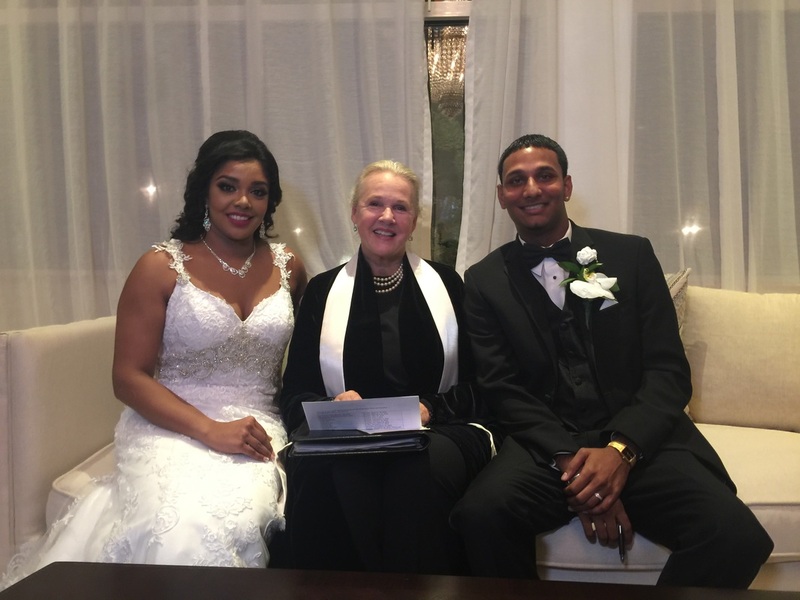 She interviewed my husband and I separately, and shared our love story at the ceremony that made my friends cried. It was just so touching even I cried a little. I have many guests asking me how I found Caroline and said she was great! I asked to do a Chinese wine exchange ceremony that she's not very familiar with, but she took time to do a lot of research!! She was also very thoughtful; my father doesn't speak much English, but she made sure she can communicate with my father and have him play a role so he doesn't feel left out. She also explained the motive of everything so we understand why we do what we do. After giving so many examples, I think all I want to say is just this: she truly cared about my wedding!! Thank you Caroline!Thank you so much, Caroline! Caroline gave us the most amazing ceremony! She is obviously someone who loves marrying people and makes every couple feel special. This was not a cookie-cutter ceremony by any means. She met with us once for over an hour, and we hit it off immediately and decided to stop our search at that point. We emailed over the next month or so, and we spoke on the phone a few times. She interviewed each of us separately to piece together our love story. She was very organized and explained a lot of details about the ceremony that we didn't know. Caroline went above and beyond in getting to know us. 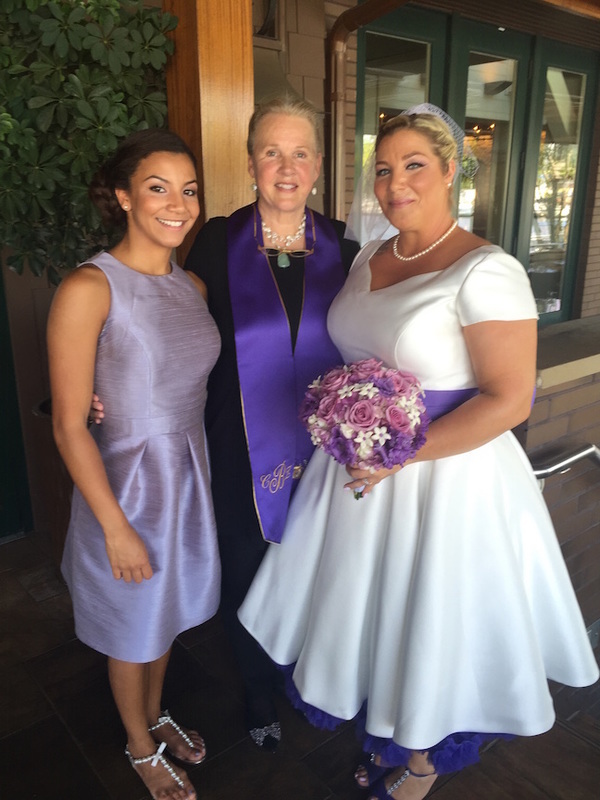 She spent time with us over the phone and in person before the ceremony. 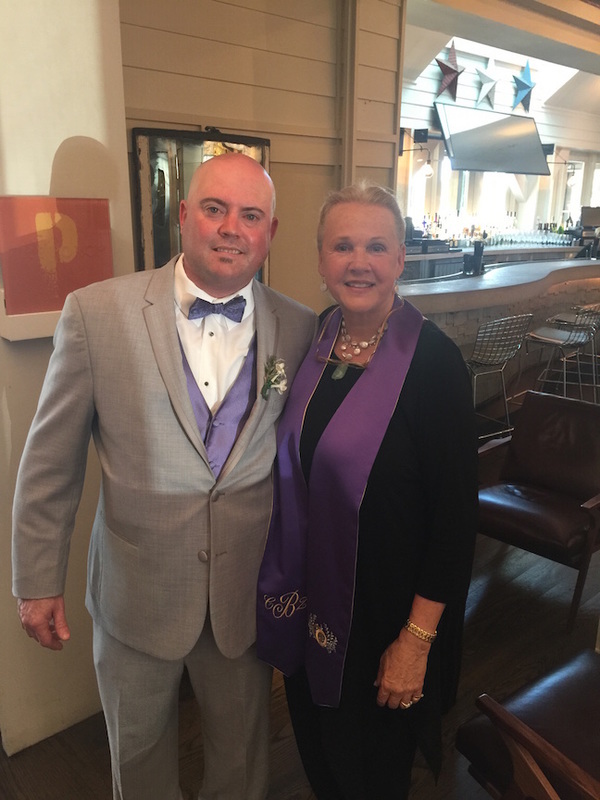 Leading up to the ceremony, she was very organized and provided us with a timeline and detailed instructions. 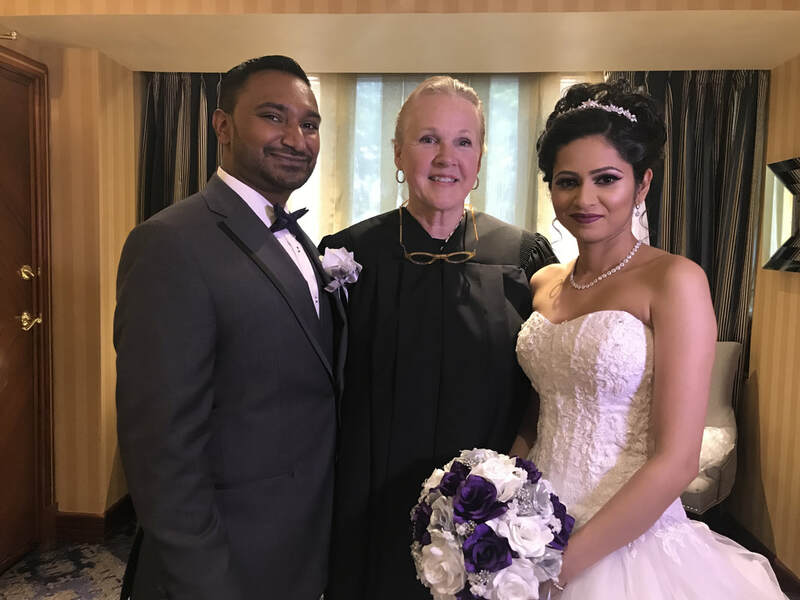 She delivered a warm, unique, funny ceremony that really captured our love and unique personalities. 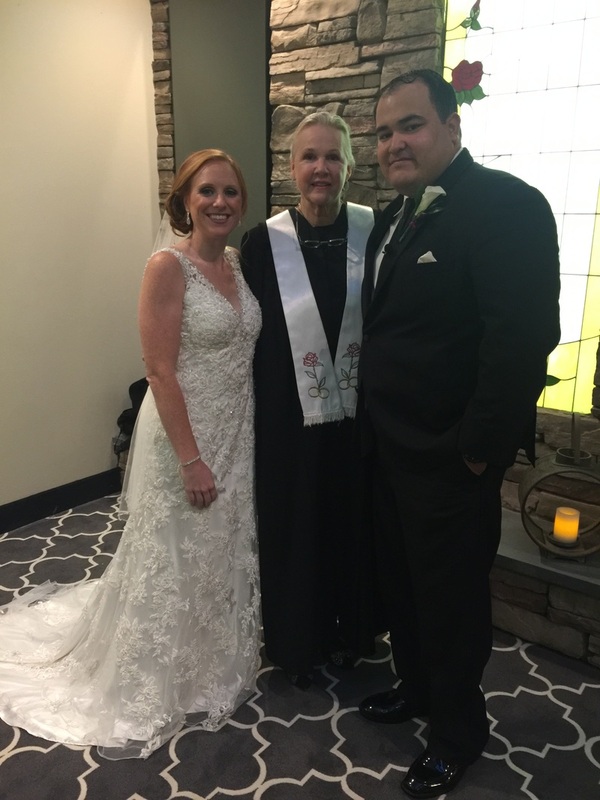 Thank you for being our officiant! 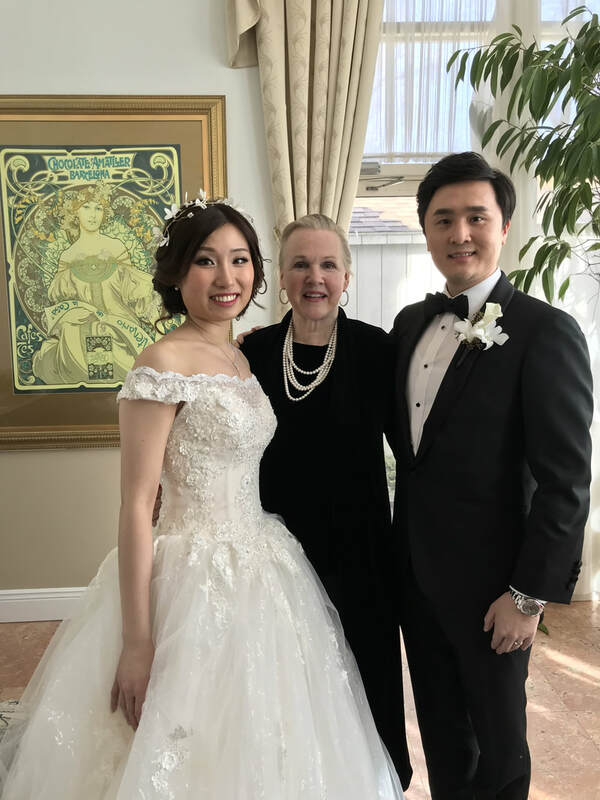 I don't know if you noticed, many of my guests cried at the ceremony because the way you delivered our love stories was just so sweet and touching! I was able to hold my tears because I was overwhelmed by joy! Many of my friends also asked how I found you! 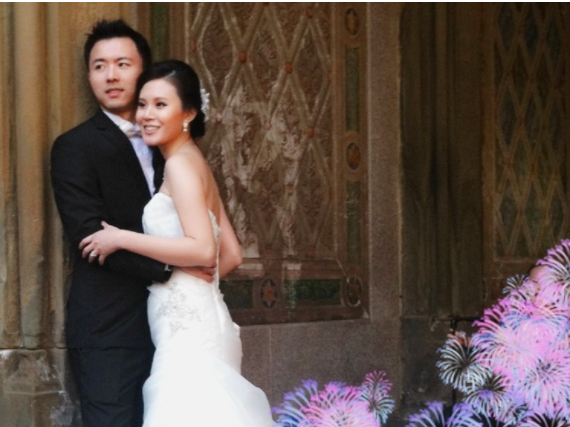 I have posted reviews on theknot.com and weddingwire.com. I'm very glad to write these reviews because you are truly wonderful!! And thank you for the Keepsake Copy of our vows. Alex and I were going over the script today and were amazed by the quality of the paper. It can definitely last a long time and we can still read it years from today!! Thank you. Thank you so much, CZ! You did an amazing job! Everyone was commenting on how personal and heartfelt the ceremony was. It will be a day that we will cherish always. Thank you for being such a big part of it. Brian and I just wanted to thank you from the bottom of our hearts for making our wedding ceremony so personal and memorable. It was absolutely perfect and everyone couldn't stop talking about how incredible it was. 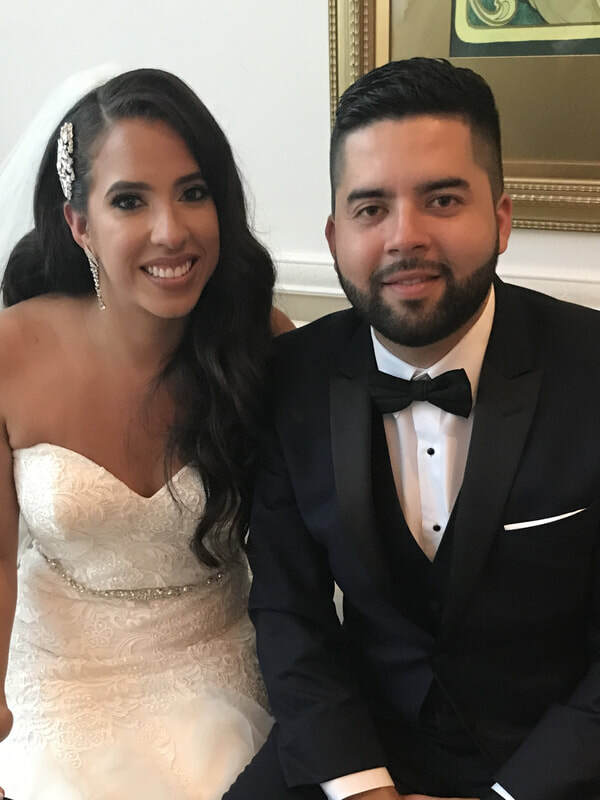 Our guests kept commenting on how warm and welcoming you are and how you really got to know us and made the ceremony so customized to us and our style. The consensus was "it was so Brian and Kelly"! Thank you for officiating our marriage, Caroline. We couldn't have asked for a better experience - from meeting you the very first time months ago to our big day on 12/13. We look forward to keeping in touch! Just wanted to say the ceremony was absolutely beautiful. All our guests raved about how wonderful and personal it was. They said it was the best ceremony they've ever been to. Thank you so much for everything! 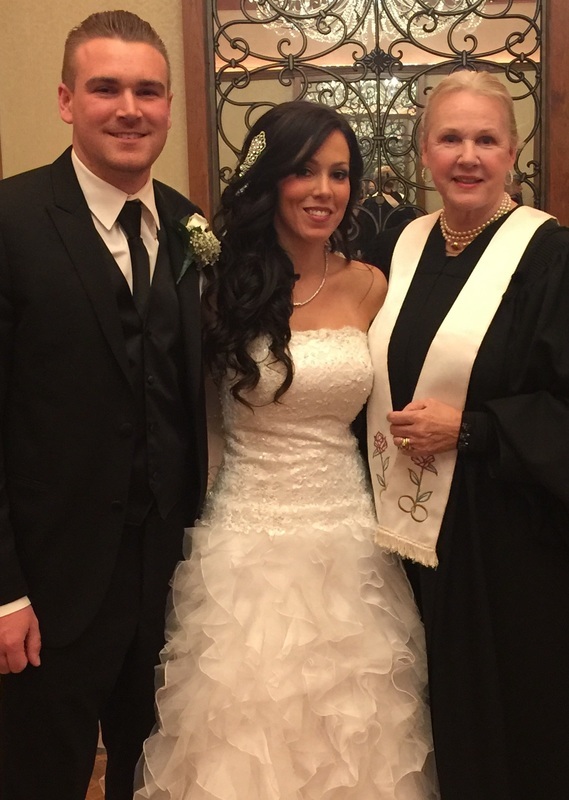 Caroline was amazing and we are so thankful that she officiated our wedding. She was warm, funny and very professional. 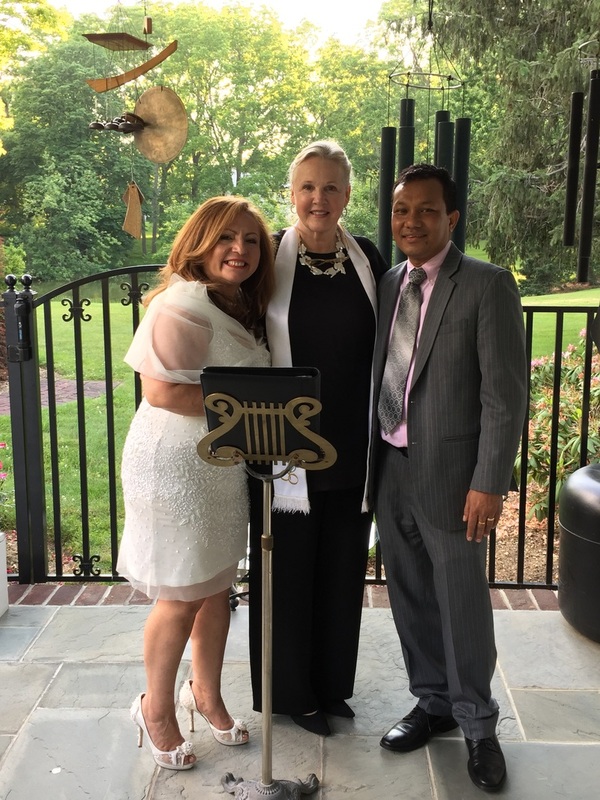 We loved how she told our love story and we appreciate that she took the time to really personalize the ceremony. Caroline's detailed rehearsal was very helpful to the whole wedding party, as well (especially for my dad, who was pretty nervous!). 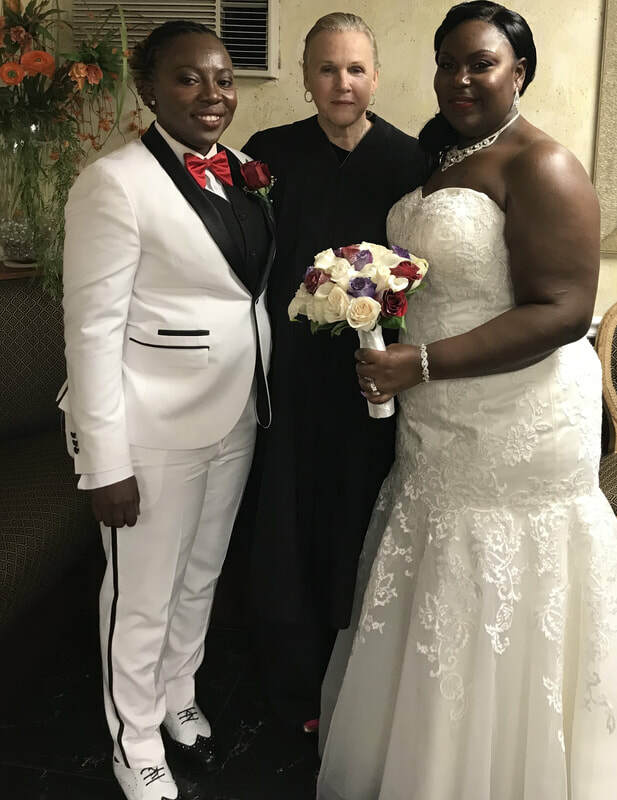 Thank you very much for making our ceremony so memorable--it was everything we hoped it would be!! We received many compliments from our guests, as well. nice to be surrounded by our dearest family and friends. You made it all happen. We'll never forget that day. "So personal. Beautifully done. Joyful." We couldn't have asked for a more heartfelt wedding. Thank you.